The Plate Boutique aim to give you information and inspiration to make healthy eating a way of life. Healthy eating isn’t boring – it’s not all about salads! Healthy foods are good for us and can be delicious. 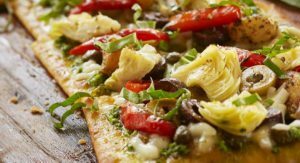 If you’re not sure what healthy food choices are, or if you are already following a healthy, wholesome diet but need some new recipe ideas — we have gathered together our three favourite recipes including a flatbread recipe that can replace your usual pizza. Healthy eating means that you can eat desserts too, in moderation, so we’ve added a no-bake sweet treat to our list. This delicious dish is perfect for a busy weeknight dinner. 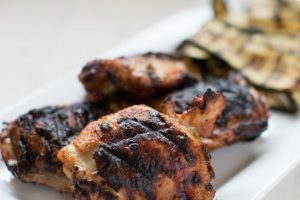 If you want extra flavour, marinade the chicken the night before. This is a gluten free recipe and good for people living with diabetes or for those wanting to lose weight. Prep Time: 1 hour (includes marinating time). In a medium bowl, whisk together all the marinade ingredients. Place the chicken tenderloins in a large plastic storage bag. Pour the marinade over the tenderloins and coat well. Seal bag and refrigerate for 1 hour or overnight. Spray the grill with cooking spray and preheat to medium-high. Place the chicken tenderloins on the grill and brush with any remaining marinade. Grill for about 4-5 minutes per side or until done. Brush the zucchini with olive oil. Grill for 3-5 minutes per side. Serve the chicken tenderloins with zucchini rounds. A year round recipe, and a reminder in cooler months of warm and sunny places is this meditteranean flatbread with olives, artichokes and roasted red peppers. Use a pre-made wholewheat dough base and it’s likely that you won’t crave your usual high calorie pizza. In a small bowl, combine tomatoes, olives, artichokes, roasted red peppers, garlic, lime juice, and parsley. Toss until well combined and set aside. Preheat oven to 450˚. Roll the pizza dough out in a rectangle 8” by 12”. Transfer to an oiled or parchment covered baking tray. Rub dough with olive oil and sprinkle the olive mixture evenly over the dough. Follow with feta, starting with 1 ounce, adding more as desired. Bake for 12 to 15 minutes until crust is crisp. Remove, cut, sprinkle with parsley and serve. Perfect for a sweet treat, start with all ingredients at room temperature. Combine the oats, seeds, chocolate, maple syrup, vanilla, and coconut in a medium bowl. Add the peanut butter, and use your hands to work the ingredients together. 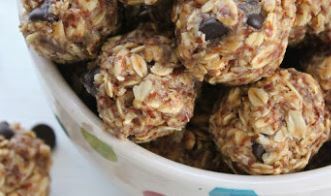 Add a little more peanut butter if the mixture won’t stay in a ball shape or add more oats if the mixture is too sticky. Shape into balls by hand and arrange on a parchment lined baking sheet or plate. Refrigerate or freeze. Makes two dozen energy bites.